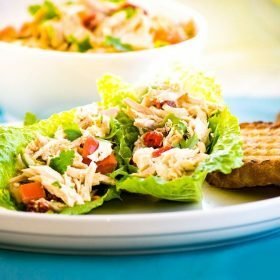 Chicken salad is perfect for picnics, potlucks, and satisfying on-the-go lunches. If you don’t like mayonnaise, this Italian spin on the classic dish might be just what you need! All it takes is a bit of chopping and mixing. And once you know the recipe, you can adjust it according to your taste. Gone is the mayonnaise and added are some delicious Italian ingredients to make this your new favorite salad. So much texture from the chewy and sweet sun-dried tomatoes, crunch from the toasted almonds, and tang from the olives, pickled eggplant, and vinaigrette–the flavors are pure Italian. This is a very versatile recipe: You can put it between two pieces of Italian bread and make a panino, or you can fill a small, hollowed-out tomato with it and serve it as an appetizer with a cocktail. I hope you enjoy and share this recipe with your friends! 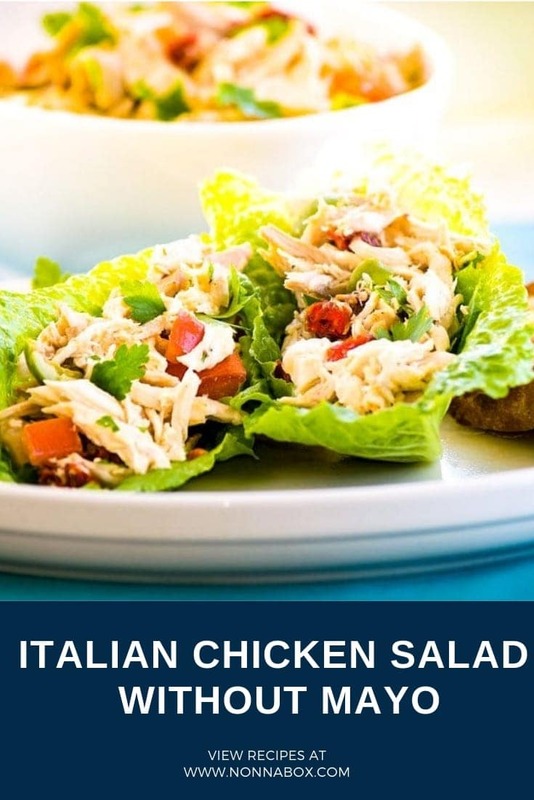 Perfect for a low calories meal, this chicken salad is easy to make. In a large bowl, combine the shredded chicken, parsley, almonds, sun-dried tomatoes, olives, diced tomato, and pickled eggplant. Season with salt and pepper to taste and set aside. Prepare the vinaigrette by combining the lemon juice, sherry vinegar, Dijon mustard, minced shallot, and olive oil in a blender or small food processor. Blend until emulsified, then add salt and pepper to taste. Pour the vinaigrette over the salad ingredients and toss to combine. 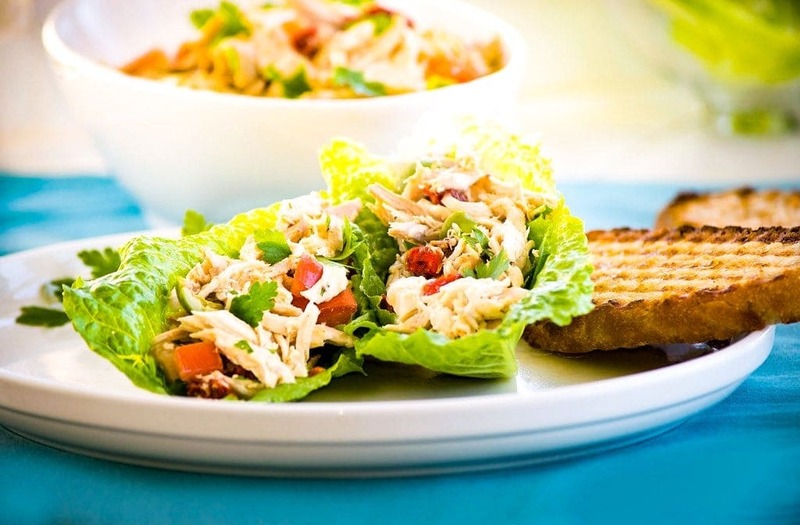 Place some romaine hearts on a plate and mound the chicken salad on top to serve.